When asked to style 1 bag, and 1 jacket, 3 different ways - I was of course up for the challenge. 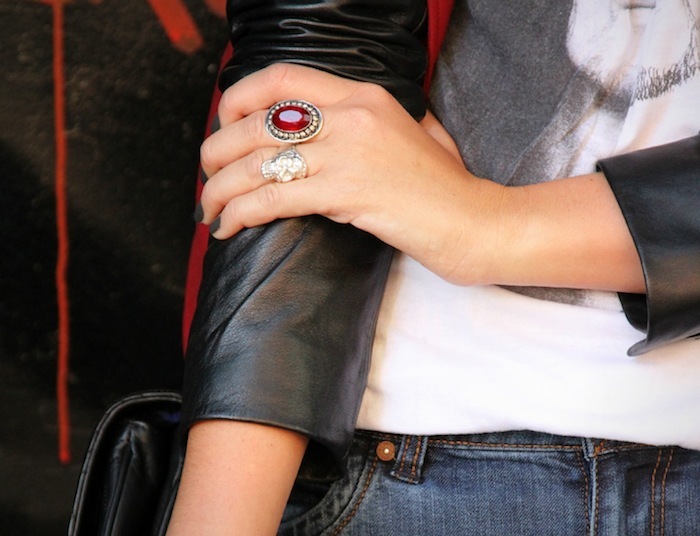 I'm obsessed with this leather sleeve jacket and even though its red, has turned out to be very versatile. The bag is adorable too, and perfect for when I'm going out at night. From the time I started blogging until now, I've watched Rebecca Minkoff grow her brand and expand in ways unimaginable for such a short period of time. The team over at RM has grabbed social media by the horns, and have jumped on the blogger ship more than other brand I know/work with. They truly know what it takes... not to mention the designs and products have become better and better with every season. The RM runway show was one of my favorites this past fashion week - and even the newly launched jewelry is right up my alley. ALERT: Rebecca Minkoff is a brand to watch. My fav is the first one!! That jacket is actual perfection! Love all three looks - you have amazing style!! oh my gosh..... difficult to choose seriously! all combo are good! well, i love all the 3 looks!!! One of my favorite pieces for the fall are the jackets with leather sleeves. I loved yours so much!